Is He on Good Behavior or Is This Lasting Change? My client, Margie, has been married for 32 years to Chuck, whom she met in college. She put her life on hold for more than 2 decades, pouring all her love and energy into raising her two boys and being a teacher. But now she’s ready to make herself a priority – to begin to live again, to travel, to have experiences that bring her joy and meaningful connections in her relationships. She’s ready to honor what she needs and make the necessary changes to create a happy life. She’s ready to determine if her marriage can be saved or if it’s time to leave it. Chuck, however, doesn’t have those same aspirations for his own life. He works all the time and any down time is spent either watching TV or sleeping. He struggles with depression, or at least that’s how she explains his behavior and lack of engagement in his own life. They haven’t been intimate with one another in years and have made it a practice in their relationship to avoid confrontation, as opposed to having open, honest, loving conversations when things aren’t working. In order for Margie to have the clarity she needs about whether or not her marriage can be saved, she needs more information, she needs to see if change is possible for both of them. And she doesn’t want them to fall back into old habits and old patterns and end up in this exact same place one year or ten years from now. The first thing we worked on together is equipping her to express her feelings to her husband and telling him what she needs. Not nagging, not guilting him into changing; but rather, just being very straightforward about what she needs and the change she needs to feel in the relationship in order for it to work for her. Margie genuinely wants to give this marriage a shot at working and she still cares for Chuck. She hates to see him so unhappy, but she is not willing to live her next and last 30 years in this life feeling alone, unloved, disconnected and unhappy just so he can be comfortable in his unhappiness. So the question for her becomes, Can Chuck be the man that genuinely wants to be happy, embraces life and opens up to her in ways he never had to previously? He wants to. He says he will do whatever he needs to do because he doesn’t want to lose his wife and frankly, his only friend on the planet. But he doesn’t know how, so she has to tell him. And then she has to wait…..
And she has to understand if his actions are based on being on his best behavior in order to smooth over this danger zone they’ve hit, or if he is taking action that will lead to lasting change. Doing all the things around the house you’ve been asking him to do for decades: Unloading the dishwasher, installing that ceiling fan, not getting mad at you when you have dinner with your girlfriends. Investing in a coach or a therapist that can teach him a new way of engaging with his wife and holding him accountable to do so, reading books that deepen his awareness about things like emotions and connection, and sharing his heart with you, even when it feels awkward and scary. 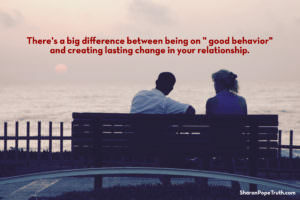 There’s a big difference between being on good behavior to pacify you and get past this rocky part in your relationship and committing to learning new skills and forming new habits that provide the opportunity for a new kind of relationship to be formed between the two of you.